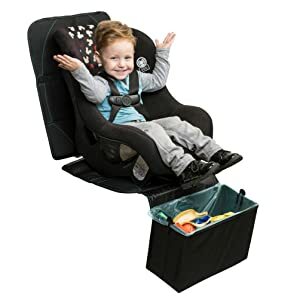 KEEP SEATS LOOKING LIKE NEW – Our baby seat guardian puts a layer of thick waterproof material between your child and the upholstery in your vehicle from the base up to the head support, so you never have to worry about spills and dirty infant feet. 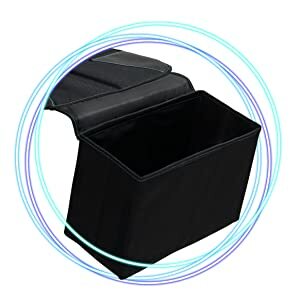 It’s also perfect for keeping pet hair and muddy paws off the leather or fabric and for keeping groceries and other items from spilling. MANAGE MESSES WITH EASE – PATENT PENDING INVENTION – The Babyseater has a feature not found in any other car fabric protectors today! 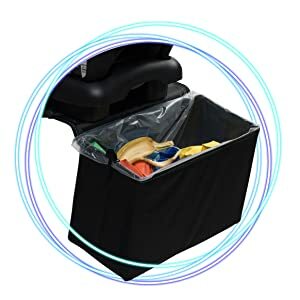 We’ve added a garbage can to the bottom of ours, so you have a place to toss empty cups, fast food wrappers, tissues & more. Three free garbage can liners are included as a gift, and you can buy a roll of inserts separately. 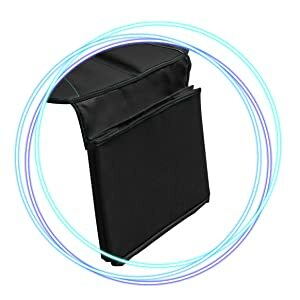 SO EASY TO INSTALL – You can have our seat saver carseat protector inserted in any car, truck or SUV in a hurry thanks to our easy installation system. 1 minute installation and place the booster on top of a protective quality mat! SPECIAL GIFT TO YOU – Buy our car protector for kids and pets today and we’ll give you a free e-book 50 Tips for Driving with Kids that every parent MUST read. Give your loved ones gifts that matter. 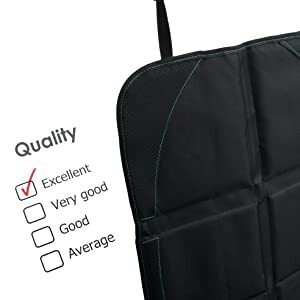 SATISFACTION GUARANTEED – We designed the Babyseater car seat protectors to be the best on the market today, and your satisfaction is our top priority. If you’re not delighted with your purchase for any reason, you can return it for a refund. Traveling with your baby, child or pet can be oh-so-enjoyable for your family, but having little ones or furry friends in the backseat isn’t so fun for your vehicle’s upholstery. Bottles get spilled. Sneakers scuff the fabric and pet hair gets everywhere. Plus, you end up with so much trash to deal with while you rack up the miles. If only there was an easy way to keep the car neat! Well, there is! The Babyseater Car Seat Protector allows you to protect the seats and with a patent pending invention you can keep trash contained all with one revolutionary design, We’ve taken the seat saver car seat cover and combined it with a spacious garbage can, which rests on the floor and has plenty of room for those coffee cups, fast food wrappers, tissues, and napkins. O MUCH EASIER TO INSTALL. You can have our car seat protector installed in any vehicle in minutes due to its easy-to-install design. Drinks, formula, mud and even pet urine can’t get through our seat saver carseat! Our heavy-duty design is much stronger than other car fabric protectors to ensure that it can continue to protect your car for years to come. √ WETNESS – you’ve been working out , good for you ! going to the beach, even better ! now simply get into your car without thinking of getting the seat soaked. When the garbage can is full, just lift out the liner, tie the top and toss it, now you’re trouble free!